Kuwait City (Arabic: مدينة الكويت, transliteration: Madīnat al-Kūwait), is the capital and largest city of Kuwait. The city is located on the southern shore of Kuwait Bay off the Persian Gulf. 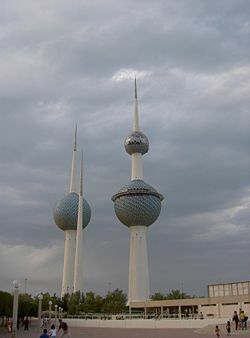 Kuwait City is the seat of Kuwait's parliament (Majlis Al-Umma), most of the country's government offices, and the headquarters of most Kuwaiti corporations and banks. It is the political, cultural, and economic center of the emirate. The city was founded at the beginning of the eighteenth century by a group of families who migrated to the coast from the interior of the Arabian Peninsula. It remained a small gulf sheikdom known locally as a center for pearl diving and shipbuilding and boat construction. In the post World War II era, Kuwait came to international prominence largely due to its enormous oil revenues. The city and the surrounding oil fields were extensively damaged during the Iraqi invasion and occupation of 1990 and subsequent Gulf War, but since liberation by an American-led coalition in 1991, the city has grown into a modern thriving business center. Kuwait City seen from Spot Satellite. The name "Kuwait City" is a transliteration of Madīnat al-Kūwait. The name may have derived from an abandoned fort located there in the 18th century, called "Kūt" (كوت) - Arabic for a "fortress by the sea." 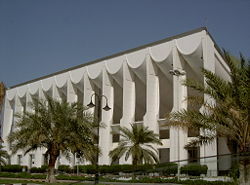 Located at the heart of the country on the shore of the Persian Gulf, and containing Kuwait's parliament (Majlis Al-Umma), most governmental offices, the headquarters of most Kuwaiti corporations and banks, Kuwait City is the indisputable political, cultural and economical center of the emirate. The main residential and business areas are Salmiya and Hawalli. 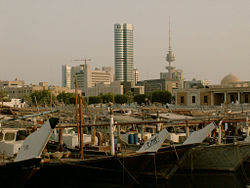 Kuwait City has a variable continental climate, with extremely hot and dry summers (April to October), with temperatures exceeding 124°F (51°C). Winters (November through February) are cool with some precipitation and average temperatures around 56°F (13°C). Average annual precipitation is 4.2 inches (107mm). The maximum average precipitation occurs in January. Kuwait has limited natural fresh water resources. Therefore, some of world's largest and most sophisticated desalination facilities provide the water for Kuwait City. Sheikh Mubarak Al-Sabah, 'Mubarak the Great' (1837-1915). A dhow with three masts. The Bayan Palace, the main palace of the Emir of Kuwait. Human occupation of the region around Kuwait City dates to around 3000 B.C.E., when the Dilmun civilization centered on neighboring Bahrain. At that time, the island of Failaka, which is located near the site of Kuwait City, was developing its own unique culture and religious pantheon. Nearchus, the admiral in charge of Alexander the Great's fleet, established a colony on the nearby island of Falaika, in the late fourth century B.C.E. In the early sixteenth century, the Portuguese built a fort in the area that became Kuwait City, using the fort as a base from which to venture north. Their residence in the Arabian Desert was short-lived, so until the eighteenth century, Kuwait was a territory of shifting communities. In 1710, the Al-Sabah family, a nomadic people of Arabian descent, settled in what became Kuwait City, which was occupied at the time by a small settlement of Bani Khalid people, who were from the eastern province of Saudi Arabia. Soon after the colony was founded, Sabah I became leader, ruling until his death in 1762, when he was succeeded by his youngest son, Abdullah I Al-Sabah. The Al-Sabāh family was a branch of the Al-Utūb tribe that included the Al-Khalīfah clan, the ruling family of Bahrain. Kuwait had one of the best natural harbors in the Persian Gulf, and its location allowed it to benefit from the caravan trade to Aleppo and Baghdad, the Shatt al-Arab (river) trade in southern Iraq, and from the smuggling trade into Ottoman territory that high tariffs encouraged. The settlement grew quickly, and by the time its first wall was built, in 1760, the town had a fleet of about 800 traditional Arab sailing dhows, and trading relations to Baghdad and Damascus. It was a successful and thriving sea port by the early nineteenth century. In 1766, the al-Khalifa and, soon after, the al-Jalahima, left Kuwait en masse for Zubara in Qatar, leaving the Sabahs in undisputed control. By the end of Abdullah I Al-Sabah's long rule (1762-1812), Sabah rule was well established. Kuwait's first contact with Britain occurred in 1775, when plague, then the Persians, struck Basra and the British East India Company made arrangements to have the Persian Gulf-Aleppo Mail Service diverted through Kuwait. Although Kuwait was nominally governed from Basra, the Kuwaitis had traditionally maintained a relative degree of autonomy within the Ottoman Empire. By the late 1870s, the Ottomans were bankrupt, and additional income was required from Kuwait and the Arabian Peninsula. Midhat Pasha, the governor of Iraq, demanded that Kuwait submit to Ottoman rule. In May 1896, Sheikh Muhammad Al-Sabah was assassinated by his half-brother, Mubarak al-Sabah (the Great) who, in early 1897, was recognized by the Ottoman sultan as the provincial sub-governor) of Kuwait. In July 1897, Mubarak invited the British to deploy gunboats along the Kuwaiti coast, leading to the First Kuwaiti Crisis, in which the Ottomans demanded that the British stop interfering. In the end, the Ottoman Empire backed down. In January 1899, Mubarak signed an agreement with Britain that in return for an annual subsidy of 15,000 Indian rupees (£1500) to Kuwait's ruling family, British consent was required for any of Kuwait's international relations. Britain took responsibility for Kuwait's national security. Kuwait was a center for pearl diving. The advent of Japanese pearl farming during the 1920s and 1930s meant the pearl industry collapsed, and with it Kuwait's economy. Kuwait became one of the world's poorest countries and became even more dependent on Britain for protection. Oil was discovered there in 1936. By 1953, the country became the largest exporter of oil in the Persian Gulf. This massive growth attracted many immigrant laborers and foreign workers. Having amassed great wealth, Kuwait was the first of the Persian Gulf Arab states to declare independence—on June 19, 1961. Kuwait experienced an unprecedented era of prosperity under Emir Sabah al-Salim al-Sabah, who died in 1977 after ruling for 12 years, and under his successor, Emir Jaber al-Ahmad al-Jaber al-Sabah, who died in January 2006. The country was transformed into a highly developed welfare state with a free market economy. During the Iran-Iraq War (1980-1988), Kuwait was allied with Iraq. However, Iraq's president Saddam Hussein (1937–2006) claimed that Kuwait was an Iraqi province. On August 2, 1990, Iraqi forces seized the city and on August 8 they annexed the emirate. During the occupation, the city was extensively damaged and many buildings were destroyed, including the Kuwait National Museum. In early 1991, an American-led coalition of 34 nations fought the Persian Gulf War to remove Iraqi forces from Kuwait. After six weeks of fierce fighting, the coalition forced Iraq to withdraw on February 26, 1991. After Iraqi forces retreated, Kuwait spent more than $5-billion to repair oil infrastructure damaged during 1990-1991. Foreign investors and the Kuwaiti government were actively involved in modernizing Kuwait City and turning it into a world-class business hub. Kuwait is a constitutional hereditary emirate in which the executive comprises the chief of state and Crown Prince. The prime minister, who is head of government, is appointed by the emir. The Council of Ministers (cabinet) is appointed by the prime minister and approved by the emir. The unicameral National Assembly, or Majlis al-Umma, consists of 50 members elected by popular vote to serve four-year terms. All cabinet ministers are also voting members of the National Assembly. Kuwait is divided into six governorates. The governorates are subdivided into districts. Kuwait City is the capital of the Al Asimah governorate. The main palace is the As-Seef Palace in the old part of Kuwait City where the Emir runs the daily matters of the country while the government headquarters are in the Bayan Palace and the Emir lives in Dar Salwa. Burgan Bank in Kuwait City. Kuwait is a small, rich, relatively open economy with self-reported crude oil reserves of about 104 billion barrels - 10 percent of world reserves. Petroleum accounts for nearly half of gross domestic product, 95 percent of export revenues, and 80 percent of government income. High oil prices during 2007-2008 helped build Kuwait's budget and trade surpluses and foreign reserves. However, despite its vast oil reserves, Kuwait experienced power outages during the summer months in 2006 and 2007 because demand exceeded power generating capacity. Kuwait lacks water and has practically no arable land, thus preventing development of agriculture. With the exception of fish, it depends almost wholly on food imports. About 75 percent of drinking water must be distilled or imported. Per capita GDP was estimated at $55,900 in 2007. 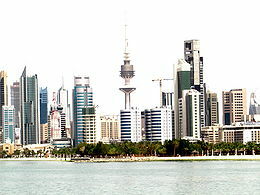 Kuwait’s booming economy has allowed many international hotel chains to enter agreements to open hotels in the country. According to the Kuwait Hotel Owners Association, in 2008 over 25 new hotels were planned or in construction. Kuwait’s road system is well developed by regional standards. There was no railway system in 2008, although the government plans to construct an underground metro to ease traffic congestion. Kuwait City’s trade and transportation needs are served by Kuwait International Airport, Mina Al-Shuwaik (Shuwaik Port) and Mina al-Ahmadi (Ahmadi Port) 50 kilometers to the south, on the Persian Gulf coast. Kuwait City had an estimated population of 63,600 in 2006 within the city limits and 2.38 million in the metropolitan area. Kuwaitis are described usually as “white” or “brown” (“beedh” or “sumur” respectively). About 60-65 percent are Arab (brown), 30 to 35 percent are Persian (white), and 5-10 percent are signified as "others," including Africans, East Asians, or Europeans. The foreign population mainly consists of people from Egypt, India, Bangladesh, Pakistan, Philippines and Sri Lanka. Kuwait's official language is Arabic, though roughly half the country speaks the language primarily. Most foreigners speak Hindi, Urdu, Filipino or Bengali. About 75 percent of Kuwait's population is Muslim (Sunni 81 percent, Shi'a 19 percent), while Christian, Hindu, Buddhist, and others make up the remaining 25 percent. 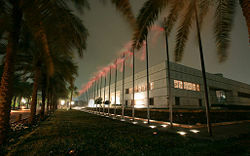 Kuwait University, founded in 1962, is Kuwait's only public university. There are several other institutions for higher learning there. The As-Seef Palace, located in the old part of Kuwait City, was built in 1896. The palace interior features original Islamic mosaic tilework, though these were badly damaged during the Iraqi occupation. The opulent palace is the official seat of the emir's court. It is not open to the public and photography is prohibited. 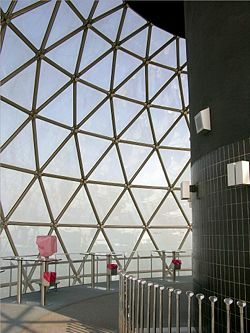 The Kuwait Museum, which was stripped of many artifacts during the Iraqi invasion. Part of the museum was open to the public in 2008. The Islamic Museum, which was badly hit during the war, was awaiting rebuilding in 2008. Kuwait's fish market is huge, elegantly decorated and impeccably clean. Sharq Souq is luxury shopping center adjacent to the fish market. 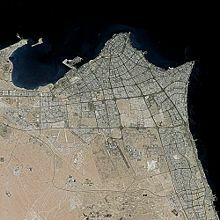 The Madinat al-Hareer ("City of Silk"), is a proposed 250 square kilometer planned urban area just opposite Kuwait City which, upon construction, would include the Burj Mubarak al-Kabir, the world's tallest structure, a natural desert reservation of two square kilometers, a duty free area beside a new airport, a large business center, conference areas, environmental areas, athletic areas, and areas that concentrate on media, health, education, and industry. The development will cost an estimated $94-billion. The government of Kuwait approved the 25-year project in July 2008. Construction had begun in that year. Oil wealth made Kuwait City the capital of one of the richest nations on the Arabian Peninsula, with a highly developed welfare state and a free market economy. That wealth has built state-of-the-art desalination plants to overcome the nation's lack of water, and has been invested in an extensive educational system, yielding a literacy rate of 93.3 percent. Kuwait's elected legislature, returned since the 1991 liberation from Iraqi occupation, has become increasingly assertive. Kuwait faces criticism for the extensive involvement of the ruling family in national affairs. Although the country is not a democracy, Kuwaitis enjoy more civil and political freedoms than the citizens of many non-democratic states. Kuwaitis take some pride in the rarity of political violence in their country. ↑ "NationMaster – Kuwaiti Geography statistics", NationMaster, 18 December 2008. Retrieved May 11, 2012. World Factbook. Kuwait Retrieved January 9, 2009. This page was last modified on 16 June 2018, at 15:23.